A YOUNG brother and sister from Emmer Green have been selected to represent Great Britain at sailing. Ed Day, 12, has been chosen to be part of the Royal Yachting Association’s UK development squad in the optimist dinghy class. And he and his nine-year-old sister Jemima have been selected for the South-East zone squad. 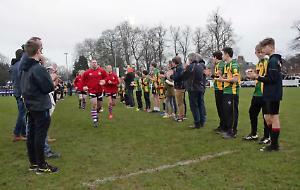 The pair were encouraged to take up the sport by their parents Stephen and Ann Day, of Kidmore End Road, after the couple’s eldest son Joe, 15, showed an interest when he was nine. Joe was trying to decide whether to sail or learn to play golf, so the couple took him to Reading Sailing Club in Sonning Eye and underwent basic training themselves. Their younger children then followed suit when they each turned six and they have become even more enthusiastic than their brother. The optimist class is a single-handed sailing dinghy usually used to teach people to sail so it’s perfect for children too. Four-time Olympic gold medalist Sir Ben Ainslie started his life in optimists as a child. To qualify for the South-East zone s squad, which covers Berkshire, Surrey, Sussex, London and Kent, Ed and Jemima had to compete in qualifiers, championships and a training selector to earn points. Ed, who is a pupil at Gillotts School in Henley, was then also selected for the UK development squad following his performances at various events at Derwent Reservoir in Derbyshire, Grafham Water in Cambridgeshire and the Weymouth & Portland National Sailing Academy. Since his squad selection he has been learning about physiology, fitness, nutrition and hydration as well as meteorology. This is to assist him as he progresses through the national squad system. When they began sailing, Joe, Ed and Jemima were all part of the “oppie” club at the sailing club, learning the basics. Mrs Day, a teaching assistant at Kidmore End Primary School, said: “Joe went, then Ed would go out with him in his boat and Jemima would have to watch from the sides for ages. The children sailed only for fun until Ed and Jemima entered an optimist race over a weekend in Septmber last year at Papercourt Sailing Club in Ripley, Surrey. This fire their enthusiasm and since then the pair have competed at other ranked events to earn qualifying points for the zone squad. Each race involves rigging the boat to set it up for the water and wind conditions. The sailors have to navigate a course marked out with buoys. The races last about an hour each and there are several over a weekend. Ed and Jemima were selected for their respective squads after performing well. Usually children remain in the optimist class until they are bigger and therefore heavier, which slows the boat down. Then they move on to classes such as laser or 49er, which are larger single vessels. Ed’s selections means he has already been on a week-long residential course at Grafham to work with national coaches and practise his skills. He said: “It’s great to go and make new friends. The children come from all over the country. “I like sailing because it’s different to the sports other people do. It’s just a fun thing. Ed has certainly not let his rapid rise go to his head, saying: “Sometimes I would forget my food or water bottle when I went out on the water!” Jemima is competing in events across the South as she continues to earn ranking points. She said: “You have to make sure you work with the wind. You need to know when to turn and look at the wind coming round so you know when you can get a lift. “The start is the most important part of the race as it gives you a good chance to get away. “You have to avoid water getting in your boat. If it does then you have to bail it out, which takes a long time so then other boats go past you. “I love racing and how challenging it is. I like sitting in my own boat, working out what the best course is. Mr Day, a freelance software engineer, said the sport had a number of benefits for the children. He said: “Sailing is a great sport for building confidence and getting exercise and fresh air and is something the whole family can participate in. “We have made lots of long-term family friends from all over the country throughout the process and it doesn’t have to be expensive. “Reading Sailing Club is a great place to start.